New York – (March 15, 2018) —EcoVadis, the leader in supply chain sustainability ratings, today announced it has been named a finalist in the World Procurement Awards, one of the most prestigious recognitions in the procurement industry. 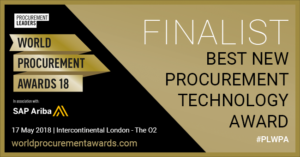 EcoVadis was shortlisted in the Best New Procurement Technology category for its ability to drive supply chain CSR visibility, improvement and innovation across global supply chains. Established and run by Procurement Leaders, the World Procurement Awards represent the best procurement related projects, people and organizations across the world. The awards recognize the collective efforts of individuals and teams and are an affirmation of the hard work, innovation and dedication of those at the forefront of this dynamic global profession. EcoVadis is also partnering with Procurement Leaders to support the CSR award category, which recognizes the procurement function that has used its influence for a positive effect, while remaining financially responsible. It will honor outstanding social, ethical, environmental and community-focused initiatives. The World Procurement Awards will be announced on May 17, 2018 at an event in London. EcoVadis is the first collaborative platform providing sustainability ratings and performance improvement tools for global supply chains. Combining powerful technology and a global team of CSR experts, EcoVadis’ easy-to-use CSR ratings and scorecards are used by procurement teams to monitor environmental, social and ethical risks across 150 purchasing categories and 120 countries. In addition to RBI members, over 200 industry leaders such as Nestlé, GSK, Heineken, Michelin, Johnson & Johnson, Schneider Electric, Salesforce, BASF, JLL, and Subway use EcoVadis to reduce risk, drive innovation and foster transparency and trust among over 40,000 trading partners. Learn more at ecovadis.com, Twitter or LinkedIn.